The remarkable rovers Spirit and Opportunity remain alive and well on the surface of the Red Planet, far outlasting their planned 90-day missions. On Jan. 24, the second anniversary of Opportunity's landing, project officials and scientists held this celebration event at the Jet Propulsion Laboratory. The New Horizons spacecraft begins a voyage across the solar system to explore Pluto and beyond with its successful launch January 19 aboard a Lockheed Martin Atlas 5 rocket from Cape Canaveral, Florida. NASA's Stardust spacecraft returns samples of cometary dust to Earth with its safe landing in Utah on January 15. NASA Administrator Mike Griffin and his deputy Shana Dale hold a news conference at Kennedy Space Center in the final hours of the countdown to the New Horizons launch. Questions from reporters ranged from the Pluto-bound mission, the agency's budget and the space shuttle program. Space shuttle Columbia's mission in January 1990 sought to retrieve the Long Duration Exposure Facility -- a bus-size platform loaded with 57 experiments -- that had been put into orbit six years earlier. LDEF was supposed to be picked up within a year of its launch. But plans changed and then the Challenger accident occurred. Columbia's STS-32 crew got into space, deployed a Navy communications satellite, then fulfilled their LDEF recovery mission, carried out a host of medical tests and returned to Earth with a nighttime touchdown in the California desert. The crew presents this post-flight film of mission highlights. TV reality show contestants aren't the only ones under threat of exile. Astronomers using the MMT Observatory in Arizona have discovered two stars exiled from the Milky Way galaxy. Those stars are racing out of the Galaxy at speeds of more than 1 million miles per hour - so fast that they will never return. "These stars literally are castaways," said Smithsonian astronomer Warren Brown (Harvard-Smithsonian Center for Astrophysics). "They have been thrown out of their home galaxy and set adrift in an ocean of intergalactic space." 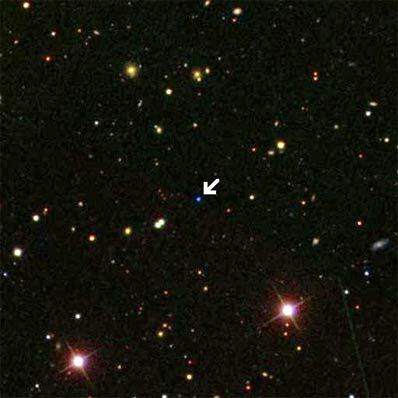 Brown and his colleagues spotted the first stellar exile in 2005. European groups identified two more, one of which may have originated in a neighboring galaxy known as the Large Magellanic Cloud. The latest discovery brings the total number of known exiles to five. "These stars form a new class of astronomical objects - exiled stars leaving the Galaxy," said Brown. Astronomers suspect that about 1,000 exile stars exist within the Galaxy. By comparison, the Milky Way contains about 100,000,000,000 (100 billion) stars, making the search for exiles much more difficult than finding the proverbial "needle in a haystack." The Smithsonian team improved their odds by preselecting stars with locations and characteristics typical of known exiles. They sifted through dozens of candidates spread over an area of sky almost 8000 times larger than the full moon to spot their quarry. "Discovering these two new exiled stars was neither lucky nor random," said astronomer Margaret Geller (Smithsonian Astrophysical Observatory), a co-author on the paper. "We made a targeted search for them. By understanding their origin, we knew where to find them." Theory predicts that the exiled stars were thrown from the galactic center millions of years ago. Each star once was part of a binary star system. When a binary swings too close to the black hole at the Galaxy's center, the intense gravity can yank the binary apart, capturing one star while violently flinging the other outward at tremendous speed (hence their technical designation of hypervelocity stars). The two recently discovered exiles both are short-lived stars about four times more massive than the sun. Many similar stars exist within the galactic center, supporting the theory of how exiles are created. Moreover, detailed studies of the Milky Way's center previously found stars orbiting the black hole on very elongated, elliptical orbits - the sort of orbits that would be expected for former companions of hypervelocity stars. "Computer models show that hypervelocity stars are naturally made near the galactic center," said theorist Avi Loeb of the Harvard-Smithsonian Center for Astrophysics. "We know that binaries exist. We know the galactic center holds a supermassive black hole. So, exiled stars inevitably will be produced when binaries pass too close to the black hole." Astronomers estimate that a star is thrown from the galactic center every 100,000 years on average. Chances of seeing one at the moment of ejection are slim. Therefore, the hunt must continue to find more examples of stellar exiles in order to understand the extreme environment of the galactic center and how those extremes lead to the formation of hypervelocity stars. The characteristics of exiled stars give clues to their origin. For example, if a large cluster of stars spiraled into the Milky Way's central black hole, many stars might be thrown out at nearly the same time. Every known hypervelocity star left the galactic center at a different time, therefore there is no evidence for a "burst" of exiles. Hypervelocity stars also offer a unique probe of galactic structure. "During their lifetime, these stars travel across most of the Galaxy," said Geller. "If we could measure their motions across the sky, we could learn about the shape of the Milky Way and about the way the mysterious dark matter is distributed." The first newfound exile, in the direction of the constellation Ursa Major, is designated SDSS J091301.0+305120. It is traveling out of the galaxy at a speed of about 1.25 million miles per hour and currently is located at a distance of about 240,000 light-years from the earth. The second exile, in the direction of the constellation Cancer, is designated SDSS J091759.5+672238. It is moving outward at 1.43 million miles per hour and currently is located about 180,000 light-years from the earth. Both stars, although traveling at tremendous speeds through space, are located so far from the earth that their motion cannot be detected except with sophisticated astronomical instruments. This research has been submitted to The Astrophysical Journal Letters for publication and will be available online. Authors on the paper are Brown, Geller, Scott Kenyon and Michael Kurtz (Smithsonian Astrophysical Observatory).